Line a 20 x 30cm baking tray with baking parchment. Melt the milk chocolate and white chocolate separately, then allow to cool slightly. Pour most of the chocolate onto the tray, roughly swirling together. 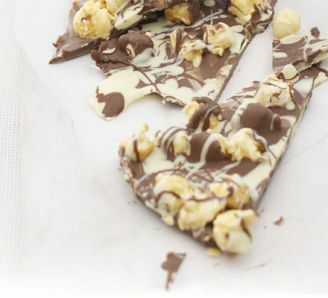 Sprinkle over the toffee popcorn, then drizzle over the remaining milk and white chocolate, and chill until set. Break into big chunks before serving.